David Beckham is retiring from soccer, ending a career in which he became a global superstar who transcended the sport. The 38-year-old Beckham, who recently won a league title in a fourth country with Paris Saint-Germain, said Thursday he will retire after the season. "I'm thankful to PSG for giving me the opportunity to continue but I feel now is the right time to finish my career, playing at the highest level," the former England captain said in a statement. Beckham, whose forays into fashion and marriage to a pop-star wife have made him a riveting international celebrity, has two more matches left at PSG. He has been giving his salary to a children's charity. He started his career with Manchester United and also played for Real Madrid and the Los Angeles Galaxy, winning titles with all those clubs. "If you had told me as a young boy I would have played for and won trophies with my boyhood club Manchester United, proudly captained and played for my country over one hundred times and lined up for some of the biggest clubs in the world, I would have told you it was a fantasy. I'm fortunate to have realized those dreams," Beckham said. On the international stage, Beckham made 115 appearances for England's national team — a record for a player other than a goalkeeper. 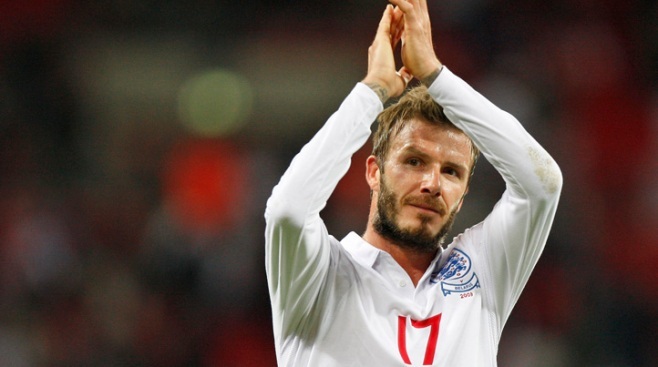 "To this day, one of my proudest achievements is captaining my country," Beckham said. "I knew every time I wore the Three Lions shirt, I was not only following in a long line of great players, I was also representing every fan that cared passionately about their country. I'm honored to represent England both on and off the pitch." With United between 1992 and 2003, Beckham won six Premier League titles, the Champions League, two FA Cups and the Intercontinental Cup. Beckham left United in 2003 shortly after manager Alex Ferguson accidentally struck Beckham's eye with a football boot. There were highs and lows in Beckham's international career. He was blamed for England's elimination from the 1998 World Cup for his petulant red card against Argentina, but scored the winning goal against the same team at the World Cup four years later. Beckham responded to jeering at the 2000 European Championship with an obscene hand gesture to England fans, but was lauded by the same supporters a little more than a year later when his last-minute free kick against Greece secured a place at the 2002 World Cup. England dropped Beckham in 2006 in an effort to renew the team with younger players after a quarterfinal exit at that year's World Cup. Coach Steve McClaren recalled him the following year after a run of stuttering form, and he returned for the remainder of England's unsuccessful attempt to qualify for the 2008 European Championship. His last England appearance came against Belarus in October 2009. He missed the 2010 World Cup because of an Achilles injury, but went to South Africa as part of Fabio Capello's backroom staff. "I want to thank all my teammates, the great managers that I had the pleasure of learning from," Beckham said. "I also want to thank the fans who have all supported me and given me the strength to succeed." "Nothing will ever completely replace playing the game I love, however I feel like I'm starting a new adventure and I'm genuinely excited about what lies ahead," Beckham said. "I'm fortunate to have been given many opportunities throughout my career and now I feel it's my time to give back."